ANTARCTIC ICE:  WHAT'S THERE AND WHERE DID IT COME FROM? of nearly 3 miles (15,000 feet). substance compact and dense enough to be called ice. mass and flows outward from its source region. 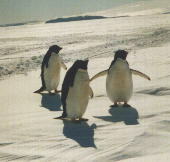 their normal position, its bed would still be below sea level. called crevasses. Blowing snow can cover these crevasses with snow bridges. of Antarctica, the crevasses are the most dangerous. of all the world's oceans by over 200 feet. possible future of the Antarctic ice sheet. 1-The students will learn how glaciers form. to large-scale melting and rising ocean level. A map with the Trans-Antarctica Expedition route marked on it. 2-How do you think glaciers form? 3-Have glaciers ever covered North America? be sure to include information about crevasse formation). they travel across the ice? 2-How would you solve the problems related to the dangers of ice travel? where the Expedition is likely to encounter them. 1-The average thickness of the ice sheet is about 7,000 feet. 2-Antarctica is 1.4 times the size of the U.S.
give an ice thickness of 9,800 feet over the entire U.S.
students practice applying their new knowledge. be if all the ice melts?" during global warming are taken into account, the answer should be 280 feet. oceans rose 200 feet or so. Nations commission on global disaster preparation. or their position on the issue. 1- Why has a deep ice sheet formed on Antarctica? a-Many feet of snow fall each year and change to ice. c-The oceans sometimes flood the continent and freeze as an ice sheet. d-The ice has been there since the formation of Earth. 2-How much of the world's ice is in Antarctica? 3-If the Antarctic ice covered the United States, how deep would it be? Trans-Antarctica Expedition face as they travel across the Continent? a-Small pieces of ice blowing into the air. b-Losing control of their sleds due to slipping on the ice. sheets form and cover part of the Continent? plans of the Trans-Antarctica Expedition? Explain your answer.